Scotch whisky (Scottish Gaelic: uisge-beatha na h-Alba; often simply called Scotch) is malt whisky or grain whisky made in Scotland. Scotch whisky must be made in a manner specified by law. All Scotch whisky must be aged in oak barrels for at least three years. Any age statement on a bottle of Scotch whisky, expressed in numerical form, must reflect the age of the youngest whisky used to produce that product. A whisky with an age statement is known as guaranteed-age whisky. A whisky without an age statement is known as a no age statement (NAS) whisky, the only guarantee being that all whisky contained in that bottle is at least three years old. The first written mention of Scotch whisky is in the Exchequer Rolls of Scotland, 1495. A friar named John Cor was the distiller at Lindores Abbey in Newburgh, Fife, where, in October 2017, malt whisky production restarted for the first time in 522 years. Many Scotch whisky drinkers refer to a unit for drinking as a dram. A Scotch whisky label comprises several elements that indicate aspects of production, age, bottling, and ownership. Some of these elements are regulated by the SWR, and some reflect tradition and marketing. The spelling of the term "whisky" is often debated by journalists and consumers. Scottish, English, Welsh, Australian and Canadian whiskies use "whisky", Irish whiskies use "whiskey", while American and other styles vary in their spelling of the term. Labels may also carry various declarations of filtration techniques or final maturation processes. A Scotch whisky labelled as "natural" or "non-chill-filtered" has not been through a filtration process during bottling that removes compounds that some consumers see as desirable. Whisky is aged in various types of casks—and often in used sherry or port casks—during distinct portions of the maturation process, and will take on characteristics, flavour and aromas from such casks. Special casks are sometimes used at the end of the maturation process, and such whiskies may be labelled as "wood finished", "sherry/port finished", and so on. Johnnie Walker Scotch whisky bottles. Blended Scotch whisky constitutes about 90% of the whisky produced in Scotland. Blended Scotch whiskies contain both malt whisky and grain whisky. Producers combine the various malts and grain whiskies to produce a consistent brand style. Notable blended Scotch whisky brands include Ballantine's, Bell's, Chivas Regal, Cutty Sark, Dewar's, J&B, Johnnie Walker, Teacher's Highland Cream, The Famous Grouse, and Whyte and Mackay. Most malt distilleries sell a significant amount of whisky by the cask for blending, and sometimes to private buyers as well. Whisky from such casks is sometimes bottled as a single malt by independent bottling firms such as Duncan Taylor, Master of Malt, Gordon & MacPhail, Cadenhead's, The Scotch Malt Whisky Society, Murray McDavid, Berry Bros. & Rudd, Douglas Laing, and others. These are usually labelled with the distillery's name, but not using the distillery's trademarked logos or typefaces. An "official bottling" (or "proprietary bottling"), by comparison, is from the distillery (or its owner). Many independent bottlings are from single casks, and they may sometimes be very different from an official bottling. —  Exchequer Rolls of Scotland, 1 June 1495. According to the Scotch Whisky Association, Scotch whisky evolved from a Scottish drink called uisge beatha, which means "water of life". The earliest record of distillation in Scotland occurred as long ago as 1494, as documented in the Exchequer Rolls, which were records of royal income and expenditure. The quote above records eight bolls of malt given to Friar John Cor wherewith to make aqua vitae (Latin for "water of life," = uisge beatha) over the previous year. This would be enough for 1,500 bottles, which suggests that distillation was well-established by the late 15th century. Whisky production was first taxed in 1644, causing a rise in illicit whisky distilling in the country. Between the 1760s and the 1830s a substantial unlicensed trade originated from the Highlands, forming a significant part of region's export economy. In 1782, more than 1,000 illegal stills were seized in the Highlands: these can only have been a fraction of those in operation. The Lowland distillers, who had no opportunity to avoid taxation, complained that un-taxed Highland whisky made up more than half the market. The heavy taxation during the Napoleonic Wars gave the illicit trade a big advantage, but their product was also considered better quality, commanding a higher price in the Lowlands. This was due to the method of taxation: malt was subject to tax (at a rate that climbed substantially between the 1790s and 1822). The licensed distillers therefore used more raw grain in an effort to reduce their tax bill. The Highland magistrates, themselves members of the landowning classes, had a lenient attitude to unlicensed distillers - all of whom would be tenants in the local area. They understood that the trade supported the rents paid. Imprisoned tenants would not be able to pay any rent. Two events helped to increase whisky's popularity: first, the introduction in 1831 of the column still; the whisky produced with this process was generally less expensive to produce and also less intense and smoother, because a column still can perform the equivalent of multiple distillation steps in a continuous distillation process. Second, the phylloxera bug destroyed wine and cognac production in France in 1880. Scotland was traditionally divided into four regions: The Highlands, The Lowlands, The Isle of Islay, and Campbeltown. Due to the large number of distilleries found there, the Speyside region is now also recognized by the Scotch Whisky Association (SWA) as a distinct region. 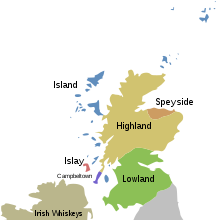 The whisky-producing islands other than Islay are not recognised as a distinct region by the SWA, which groups them into the Highlands region. The Lowlands: The southernmost region of Scotland. There are five distilleries that remain in operation: Auchentoshan, Bladnoch, Glenkinchie, Annandale and Ailsa Bay from the Girvan Distillery plus three more—Daftmill, Eden Mill, and Kingsbarns—are currently pending their first releases. Speyside: Speyside gets its name from the River Spey, which cuts through this region and provides water to many of the distilleries. It has the largest number of distilleries, which includes: Aberlour, Balvenie, Cardhu, Cragganmore, Dalwhinnie, Glenfarclas, Glenglassaugh, Glenfiddich, Speyburn, The Macallan, The Glenlivet, and The Glenrothes. Encompassing the area surrounding the River Spey in north-east Scotland, once considered part of the Highlands, has almost half of the total number (approx. 105 as of 2013) of distilleries in Scotland within its geographic boundaries; consequently it is officially recognized as a distinct region. The Highlands: The Highlands is by far the largest region in Scotland both in area and in whisky production. Some Highland distilleries: Aberfeldy, Edradour, Balblair, Ben Nevis, Dalmore, Glen Ord, Glenmorangie, Oban, Glendronach, Old Pulteney, Tullibardine and Tomatin. Although only five regions are specifically described, any Scottish locale may be used to describe a whisky if it is distilled entirely within that place; for example a single malt whisky distilled on Orkney could be described as Orkney Single Malt Scotch Whisky instead of as an Island whisky. ^ a b c d e Scotch Whisky Regulations 2009. ^ MacLean 2010, p. 10. ^ a b c d e f g Scotch Whisky Association 2009. ^ Bender 2005, p. 556. ^ "New distillery opens at Lindores Abbey in Fife". BBC News. 6 October 2017. Retrieved 31 May 2018. ^ Simpson, John A.; Weiner, Edmund S.C., eds. (1989). "dram, n.". Oxford English Dictionary (2nd ed.). Oxford, England: Oxford University Press. ISBN 978-0-19-861186-8. OCLC 50959346. Retrieved 2 July 2012. Earlier version first published in New English Dictionary, 1897. ^ MacLean 2010, p. 20. ^ MacLean 2010, p. 23. ^ a b Jackson 2010, p. 22. ^ Jackson 2010, p. 23. ^ Whisky branding deal reached, BBC News, December 4, 2003. Accessed May 2, 2012. ^ Tran, Mark (4 December 2003). "Whisky industry settles on strict malt definitions". The Guardian. Retrieved 23 March 2014. ^ Jackson 2010, pp. 419–420. ^ a b c d e MacLean 2010, p. 21. ^ a b c Jackson 2010, p. 25. ^ Scotch Whisky Association 2009, Chapter 11. ^ "Statistical Report" (PDF). Ccotch-whisky.org. 2009. Archived from the original (PDF) on 31 January 2012. Retrieved 16 November 2011. ^ "Buy Whisky Online - Single Malt Whisky & More - Master of Malt". Master of Malt. ^ Exchequer Rolls of Scotland, 1494–95, vol 10, p. 487, "Et per liberacionem factam fratri Johanni Cor per perceptum compotorum rotulatoris, ut asserit, de mandato domini regis ad faciendum aquavite infra hoc compotum viij bolle brasii. ": See also Accounts of the Lord High Treasurer of Scotland, vol 1, (Edinburgh 1877), pp. ccxiii-iv, 373, December 1497, "Item, to the barbour that brocht acqua vitae to the King in Dundee, by the King's command, xxxi shillings." ^ "History". Scotch Whisky Association. Retrieved 16 July 2012. ^ a b c "Whisky Regions & Tours". Scotch Whisky Association. Retrieved 13 May 2014. ^ "Eden Mill - Scotch Whisky". Scotchwhisky.com. Retrieved 9 September 2018. Bender, David A (2005). A Dictionary of Food and Nutrition. Oxford: Oxford University Press. ISBN 978-0-19-860961-2. Hansell, John (28 June 2010). "What Does a Whisky's Age Really Mean?". Whisky Advocate. Retrieved 17 March 2012. MacLean, Charles (2010). Whiskypedia: A Compendium of Scottish Whisky. Skyhorse Publishing. ISBN 978-1-61608-076-1. MacLean, Charles, ed. (2009). World Whiskey: A Nation-by-Nation Guide to the Best. DK Publishing. ISBN 978-0-7566-5443-6. Jackson, Michael (2010). Michael Jackson's Complete Guide to Single Malt Scotch (6th ed.). DK Publishing. ISBN 978-0-7566-5898-4. "The Scotch Whisky Regulations 2009: Guidance for Producers and Bottlers" (PDF). Scotch Whisky Association. 2 December 2009. Retrieved 24 September 2012. "The Scotch Whisky Regulations 2009". UK Parliament. 2009. Retrieved 30 April 2012. Bruce Lockhart, Sir Robert (2011). Scotch: The Whisky of Scotland in Fact and Story (8th ed.). Glasgow: Angels' Share (Neil Wilson Publishing). ISBN 978-1-906476-22-9. McDougall, John; Smith, Gavin D. (2000). Wort, Worms & Washbacks: Memoirs from the Stillhouse. Glasgow: Angels' Share (Neil Wilson Publishing). ISBN 978-1-897784-65-5. Mitchell, Ian R. Wee Scotch Whisky Tales. Glasgow: Angels' Share (Neil Wilson Publishing). ISBN 978-1-906476-28-1. Smith, Gavin D. (2013). Stillhouse Stories - Tunroom Tales. Glasgow: Angels' Share (Neil Wilson Publishing). ISBN 978-1-906000-15-8. Townsend, Brian (2015). Scotch Missed: The Original Guide to the Lost Distilleries of Scotland (4th ed.). Glasgow: Angels' Share (Neil Wilson Publishing). ISBN 978-1-906000-82-0. Wilson, Neil (2003). The Island Whisky Trail: An Illustrated Guide to The Hebridean Whisky Distilleries. Glasgow: Angels' Share (Neil Wilson Publishing). ISBN 1903238498.
Henley, Jon (15 April 2011). "How the world fell in love with [Scotch] whisky". The Guardian. London. Retrieved 22 March 2014.